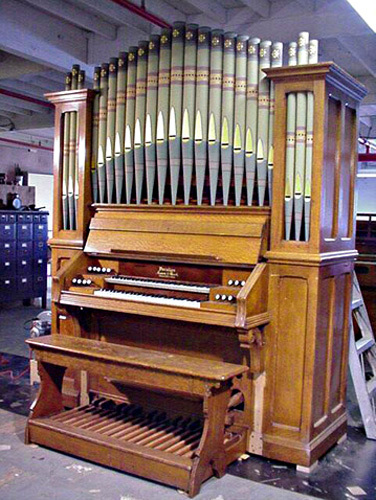 This organ was built in 1891 by the Mason & Risch Company of Worcester, Massachusetts. Since it's a reed organ, the pipes are purely ornamental. A woodturner made the replacement pipes and I painted them based on the designs from a similar organ. The instrument itself was restored by Jim Tyler, "The Reed Organ Man" and a more in depth slide show about the restoration can be found on his site. The fully-restored organ now resides in the Presbyterian Church in Redmond Oregon, and the restoration was funded by the Redmond Oregon Historical Commission.